On May 3rd, Microsoft held their Microsoft Business Forward conference: a 2 hours long session in which they took us in depth into the capabilities of Dynamics 365. Microsoft Dynamics 365 is all about empowering companies by providing the technologies they need to power their digital transformation. The product endeavours to accomplish this by entirely shifting the way we look at and handle essential aspects of a company’s business processes. Several exciting announcements were made over the course of this Business Forward session, including the new capabilities brought in by the integration of LinkedIn and Dynamics 365 and the way this will affect Sales and Talent Management. We also got the chance to see demos of the way Dynamics 365 will entirely change retail processes and revolutionise field service. In his keynote speech, Satya Nadella reminded us that Dynamics 365 is inscribed in a big picture goal, which is to help businesses to use technology in order to make a bigger impact in the world. Dynamics 365 has been designed as a response to those four drives. Its goal is to offer a modular business solution which will provide a better answer to the challenges companies are facing. In that sense, Dynamics 365 presents a fundamental change in the architecture of what Microsoft Dynamics is. The previous state of technology offered a variety of solutions and applications which could each take care of a specific aspect of a business. These separate units fell slightly short of what they were aiming to do. Dynamics 365 aims to provide a unified system of intelligence which makes all these units work together within a company. It allows to create feedback cycles which not only record what happens, but also help to take the appropriate action. Three essential changes are currently taking place. The first consists of breaking down monolithic suites into modular business applications. Business processes usually involve collecting data, making predictions from this data, then taking action based on these predictions, which leads to a field service. The modular business applications allow to create a whole new automation loop with these processes. 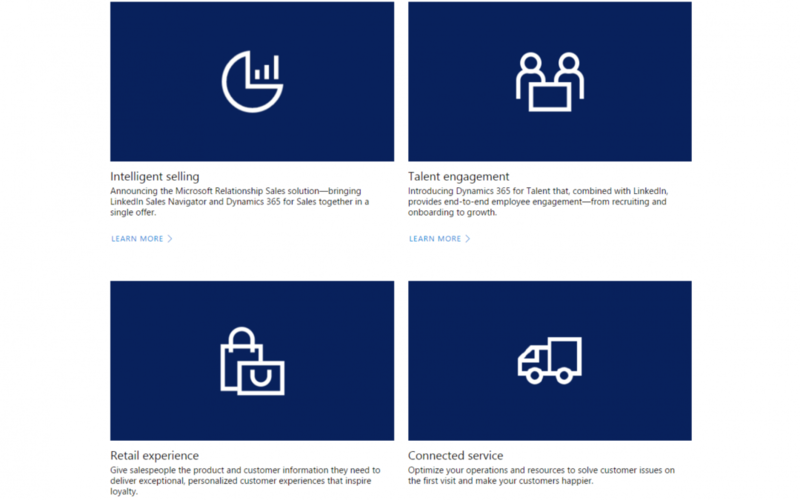 With Dynamics 365, you can take any module you need and to connect it to any other module, thus empowering businesses to create the type of automation they need. The second main change comes from the fact that companies work with a variety of applications (ERP, CRM, Office 365…) which each are collecting data, but whose data slots are disconnected. Dynamics 365 connects this data together, thus making it possible to add artificial intelligence to the process. This provides businesses with the ability to reason without being bound by one application. This is why Dynamics 365, Office 365 and LinkedIn are now coming together. The third change has to do with the fact that so far, solutions have been requiring a lot of work to be customised to a specific business. And because businesses keep evolving, those solutions needed to be constantly adjusted, which was a challenge because of how different extensibility models are between ERP, CRM and communication systems. Dynamics 365 allows for a single customisation and data model across all applications and channels. This new solution enables businesses to build systems of intelligence which are unique to them. This Microsoft Business Forward session was about demonstrating how these principles are being brought to life. Watch Satya Nadella’s full keynote speech on the Dynamics 365 YouTube channel. In our modern, connected world, selling to a company or to an individual requires access to a number of resources. Sales professionals are expected to do their homework and gather information about the company to whom they are selling. A buyer would now expect not to have to deal with cold-calling, and would prefer to be introduced to the sales professional in a warm, personable way which will show that their business needs are understood. The LinkedIn Sales Navigator provides insights on how to target the right companies, how to reach out to the right people within these companies, and how to keep your database of contacts up to date despite the fact that the people with whom you are connected tend to change jobs regularly. Traditional CRM systems offer a rather rear-view way of working: they keep track of your lists of opportunities and your past contacts, but don’t advise you on what to do next. Microsoft Relationship Sales combines the LinkedIn Sales Navigator with Dynamics 365, offering access to a world of business applications which will help sales professionals with determining what their next steps should be. Until now, we had to put data into CRM systems to generate leads. Now, you can receive warm leads from LinkedIn, Office 365 and Dynamics 365. Microsoft Relationship Sales ranks your potential sales deals based on the amount of interactions you’ve had with your customer, and points out the ones that require your attention. The solution tracks all messaging history, including on LinkedIn, and notifies you when an email you sent hasn’t received a response. It also allows you to extend your network within the client company by finding out who else on your team might be connected to their employees. PointDrive provides the ability to create a set of content tailored specifically for a given customer, which includes videos, documents and websites all in one online page, which can be shared using one unique link. PointDrive also shows you who in the customer company has seen the content you have sent and which parts of the content they have viewed. This way, sales professionals can know who are the decision makers within the targeted company, and what they are interested in, and use this information to prepare their sales pitch. The integration of LinkedIn with Dynamics 365 moves the talent management process from a reactive posture to a proactive one. Companies can take an active approach to their hiring process by targeting and contacting the best prospective candidates via LinkedIn. They can then establish smart hiring processes and empower employees to progress with their career. Hiring managers can now track what the internal recruitment team has been doing through Dynamics 365 thanks to its integration with LinkedIn. They can see who is applying and at which stage of the process they currently are. Each candidate’s LinkedIn profile is fully integrated to Dynamics 365, and available to the whole hiring team. The integration of Dynamics 365 and Office 365 enables to set-up interviews which fit within the hiring team’s schedule. Calendar invites can be sent directly from Dynamics 365, and invite responses can be tracked from there as well. During the interview, each interviewer can make notes and enter feedback on Dynamics 365, thus making it available to the hiring manager. This feedback can be provided from a mobile device or tablet. The solution also allows to send job offers and to handle the on-boarding process. The hiring manager can create on-boarding guides and templates with a checklist of activities which need to be completed by the new employee. This list can be accessed by the candidate before they even start. Employee’s career progression can be more easily facilitated through Dynamics 365: useful contacts within the company can be suggested to each employee based on their role and experience. New employees can also be connected to existing employees whom they might know. Dynamics 365 can also capture each employee’s past experience to allow managers to assign them the best projects and tasks. So far, Retail has been about focussing on one specific in-store transaction at a time. Now, by pulling data and building a collection of systems, we can easily find information about each customer who walks into the store and know who they are, and what they are likely to be shopping for. Sales people in store can easily access a customer’s purchase history, favourite items and shopping preferences. This can be used to automatically generate personalised offers for each customer, but also, in store, to identify the best upsell and cross-sell opportunities. Dynamics 365, PowerBi and PowerApps are coming together to proactively identify potential issues at the customer sites and send technicians before a problem occurs. By pulling data from Dynamics 365 and Onsite sensors, each site’s performance can be monitored easily and a variety of issues can be prevented. Dynamics 365 allows for easy management of technician’s workloads and routes. It helps to identify who is available for a given job, who is the best technician for this job, and where each resource is at a given moment. Professionals can be mobilised on the go with mobile apps and their workloads can be optimised by adjusting their routes. Dynamics 365 can also send automated voice messages to a customer to let them know that a potential issue has been identified and that a technician is on their way to fix it, as well as generate a customer survey to be filled after the intervention. PowerApps and Dynamics 365 allow to pull data together from a variety of sources to create a proactive system, without writing code. If you would like to hear the keynote speeches and watch the Dynamics 365 demos and case studies which were presented on May 3rd, you can watch the full Microsoft Business Forward session here.